Sant Andrea della Fratte is a 17th century church. 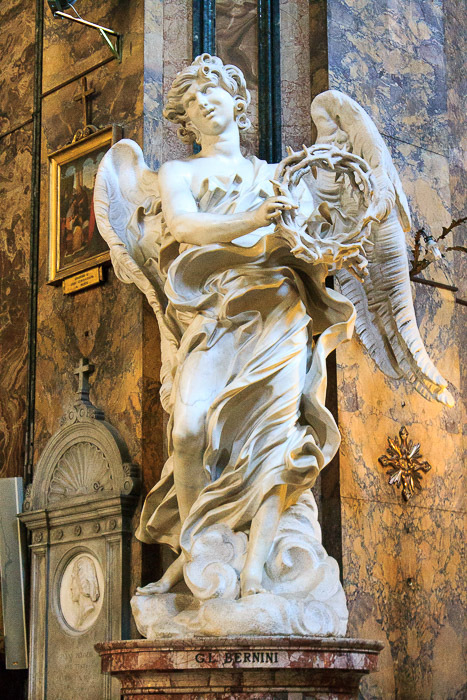 The highlight of this church, in my opinion, and the reason I stopped in, was to see the two angels sculpted by Bernini for the Ponte Sant'Angelo. 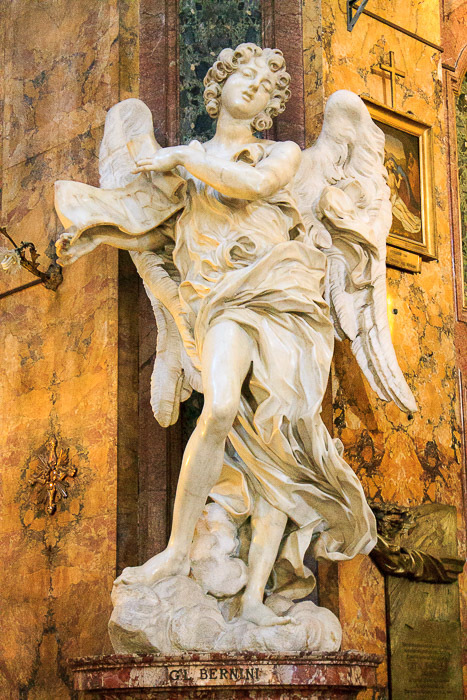 Since they were the only two statues on the bridge sculpted by Bernini himself (the others were sculpted by his students), they were considered by Pope Clement IX too valuable to stand outside in the weather, so copies were made for the bridge and the originals were moved to this church, one on each side of the high altar in 1729. One of the two sculptures is the Angel with the Crown of Thorns, shown in both photos below. 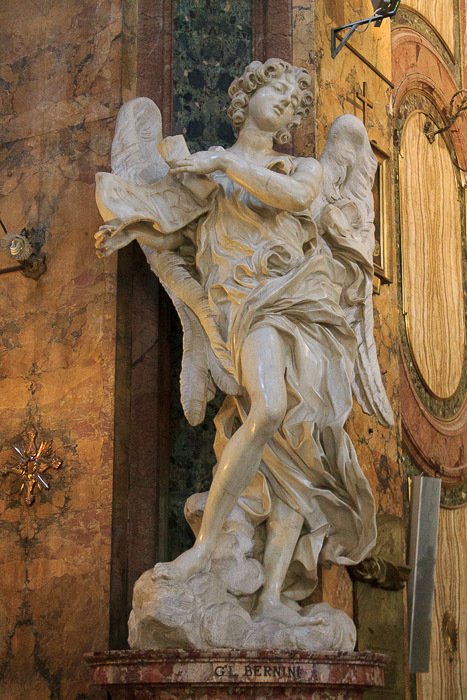 This angel is the only one from Ponte Sant'Angelo who expresses true grief about the suffering of Christ during his passion. The crown, of course, was placed upon Christ's head before his crucifixion, a symbol of the vane blindness of the men who were unable to recognize Christ's authority. According to Mark 15:17, Roman soldiers crowned Jesus with thorns before they crucified him. 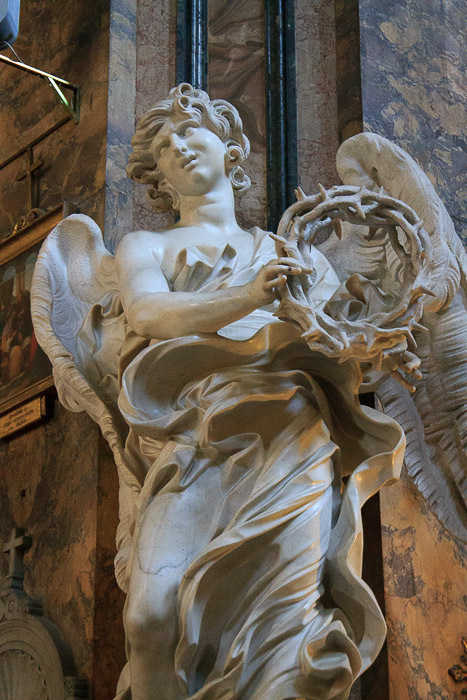 The angel expresses its emotion passionately, with intensity, conveying agonizing grief over the suffering of Christ, and is the only angel that expresses real grief to this extent. See all Sant Andrea della Fratte photos. The other of the two sculptures is the Angel with the Superscription, shown in both photos below. The face of this angel is reminiscent of St. Theresa and the Blessed Ludovica Albertoni. The angel is reacting to the sign that she carries. The Superscription consists of the letters INRI, which stands for the Latin phrase "Jesus of Nazarene, King of the Jews", which was written on the plaque at the top of the Jesus' cross (the Superscription). The way the clothing stands away from the angel's flesh looks very realistic. The wings are carved so delicately that they look like they're made of real feathers. I have so few pictures from this church because there was a service while I visited. 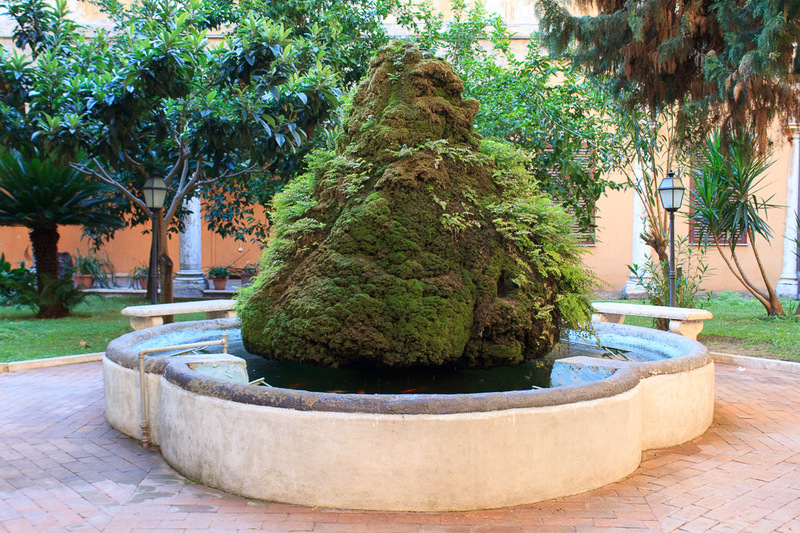 I waited about a half hour in the courtyard outside (see the photos below of the unusual fountain in that courtyard) but then gave up, snapped some pictures of the two Bernini sculptures from a distance, and moved on.